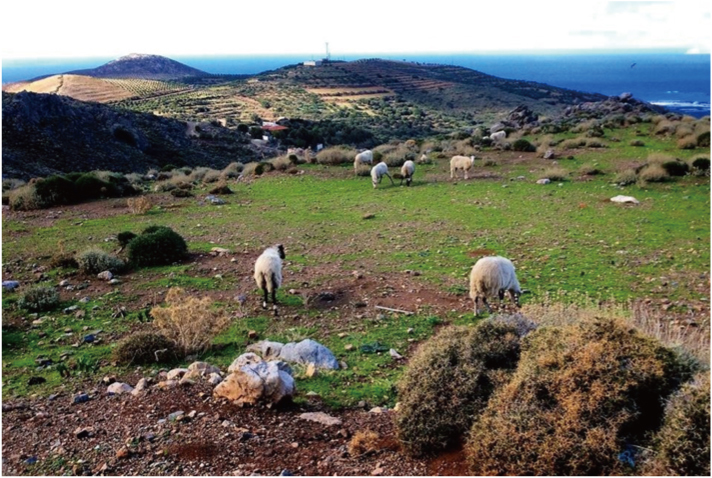 The blue Aegean that brings the cool moderating winds in the hot summer days, a soil ideally suited to the products, and people with deep love for their land. They all combine to bring to you what is pure, healthy, and tasty, free of any form of chemicals. The story begins in England, in the 1980s. It was then, that many people became ill because they eat eggs infected with Salmonella. The eggs were the product of a number of battery farms that kept hens in cages without any room to move, simply used as egg laying machines. The chickens were fed contaminated food and the eggs were infected in turn. This would never have happened if the birds were kept in an environment as near to natural as possible. In the ensuing years, many similar stories unfolded in a number of countries. Mad cow disease in England, cancerous additives in olive oil in Spain, excessive quantities of antibiotics in honey, pesticides in spinach in China and so on. For as long as there is greed, there will be people that will not stop in anything for profit. It was partially for the above reasons and partially the knowledge that Greece is maybe the last country in Europe to remain natural that made us decide to come to Japan and create "NOSTIMIA". That is when the challenge began. Hundreds of letters, E-Mail & Faxes were send out to producers in Greece and most of them replied. Catalogues, price lists and other glossary started mounding up. Then with all the information collected, I started a long car journey, visiting each and every one of them. Three months and 10,000km driving later, I had the products I wanted. For each one of them chosen, many others were rejected. They had to be the right products, for high quality, taste and most importantly produced in the way nature indented! All of them are either organically produced or produced in a way that respects nature, and without the use of chemicals, either in cultivation or in processing. Every one of them produced in the same traditional way they have been produced since time immemorial. Every one of them produced by people with deep love for their land and their heritage, living and working the land or processing its gifts in a way that respects man and nature. I present their products to you with pride and confidence. They are the products I was raised with by my parents, and I raised my daughter with, in turn, for I know that they are wholesome, pure and tasty, produced in the land of my birth. Almost fifteen years have passed since Nostimia was born in 2001. It was then that we started to make very small, very careful steps into the great unknown. Unknown was the future and unknown were the Greek products in Japan. Unknown was the reaction of the consumers to our choice of products and unknown was the reception of buyers, chefs and sommeliers. Nothing was easy! Many days, many hours and a lot of walking to visit and introduce our products. Greek products? Who ever heard of them? Greece? Where is Greece? Not many people knew Greek wine or Greek olive oil. Not one single brand existed to point the way. With faith in the quality of our products as well as the people in Greece that worked very hard to create them, we persevere. Days, weeks and months passed with no sales. We continued. Then slowly, some stores and restaurants started buying our products and then a few more. The first birthday of Nostimia had a small number of customers and some sales to saw. The exquisite cuisine with so delicate tastes that Japanese people have created points to a great sensitivity of taste. A sensitivity that can easily pick the quality of good products. And the more people that tasted our products, the more good comments we received. Nostimia was slowly taking off. Over the years our range was enlarged with new products. Most of the original producers are still with us, while new ones added expertise and more good quality. Nostimia, was growing every year together with the number of our customers. Today, we take pride in the knowledge that an ever increasing number of people know the Quality of Greek Extra virgin olive oil. The thick creamy taste of Greek yogurt. They know Feta cheese and Kalamata olives. They appreciate the uniqueness of Greek wines. We do not know where Nostimia is going to be in 15 years from now. What we do know is that no matter how big we shall become and how many varieties of products we may offer, one thing will never change! That is the promise that we shall always offer the purest and highest quality of products Greece has to offer. We own this to the hard work of our producers that over the years have done us proud and to the trust of our customers.